Cristen Conger and Caroline Ervin affectionately refer to themselves as “podcast wives.” The moniker fits: the two met in college while both working for the University of Georgia’s The Red & Black newspaper, and from 2010 until 2016 they talked feminism, history, psychology, and more as co-hosts of Stuff Mom Never Told You, a podcast, YouTube channel, and blog under the umbrella of Atlanta-based HowStuffWorks. In late January of this year, Conger and Ervin officially launched Unladylike, a podcast under their own brand, Unladylike Media. The venture, over which they have total creative control, has already garnered buzz from the likes of Forbes and recently landed on Apple’s list of “New & Noteworthy” podcasts. 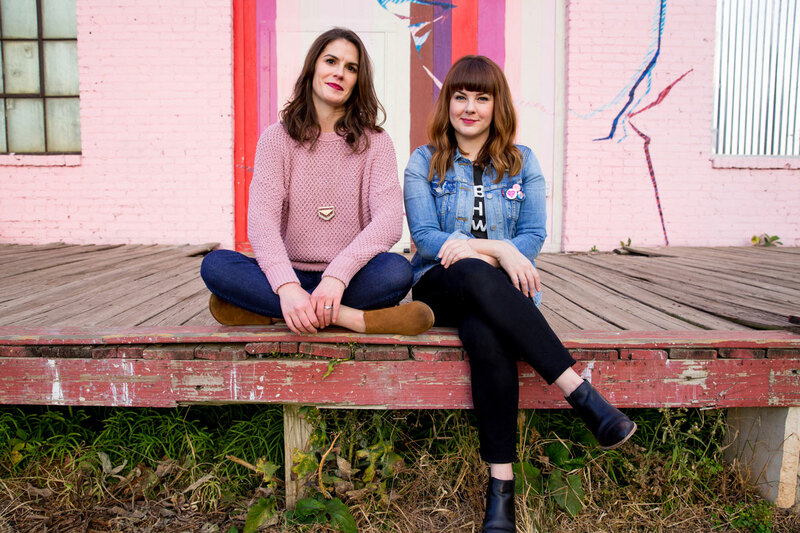 In the first few episodes alone, the Atlanta-based show has Conger and Ervin interviewing a handful of guests about everything from abortion and female friendship to body positivity and self-worth. The duo chatted with us about taking the leap to start their own company, their forthcoming book, and why it’s an exciting time to be a woman in Atlanta. What helped you decide to venture out from HowStuffWorks to creating Unladylike Media? Caroline Ervin: I had been a contractor for HowStuffWorks forever. I had a day job and was doing the podcast with Cristen on the side. When I finally got hired full-time by HowStuffWorks in October 2014, I came in with this expectation that we would eventually take it independent, whether that would be Stuff Mom Never Told You or something completely different that we created. Cristen Conger: At first, Caroline was the one coming in saying we could [launch our own brand], and then things progressed, I started saying, ‘You know what, Caroline? You were right!’ I went to [public radio station] WNYC’s women’s podcast conference, Werk It, in the summer of 2016. I was surrounded by all of these women who were doing it—I was seeing it in action. Having that role-modeled in front of me was the kick in the feminist pantsuit I needed to come back to Atlanta and get the ball rolling. It was time. It was also us wanting space to explore creatively. We wanted to expand our audio sound and the way that we produced a podcast. And we wanted to be more thoughtful about the kinds of stories we were telling. We wanted to live our feminist values out loud—and that’s not a podcast pun. How is Unladylike a departure from Stuff Mom Never Told You? Ervin: Unladylike Media is partnered with [podcast advertising network] Midroll and [internet radio platform] Stitcher. Through that partnership, we have an incredible senior producer, as well as excellent editorial feedback and advertiser support. We can also take our time with what we create. The focus is on creating better quality and more thoughtful content. Conger: I think it makes a big difference to join up with an audio native company rather than a company that evolves to develop its own podcast model. You get to a point where you really want to focus on production, telling more stories and being more narrative in your approach. In terms of creating the podcast that we wanted to hear, a big part of that was bringing in more voices. We want other women’s stories to be a central focus for Unladylike—and not just millennial, straight, cisgender white feminists like us, but a range of women from a range of backgrounds and experiences. Even though we hadn’t started developing Unladylike when the 2016 election went down, it was a massive wake-up call for us as privileged white women with a platform. We knew we needed to do more listening than talking, precisely because that was part of the massive failure that led up to where we are today. On the former show, we talked all the time about intersectionality and having inclusive conversations between each other. With this, the next step was actually bringing the voices to the table and letting people speak for themselves. What are the benefits of creating and pursuing the work you do in Atlanta? Conger: I am so, so proud of making this podcast in Atlanta. And I’m glad that my younger, Carrie Bradshaw-wannabe self did not move to New York, because we need to have voices represented regionally and geographically. Even though we’re not only talking to folks who are in Atlanta, I’m excited to plant our feminist flag here, so people can identify this podcast with Atlanta. [Hopefully it can] be an example to other women that you don’t have to move to New York, L.A., or San Francisco to make a career in media for yourself. You’ve been discussing feminism regularly for more than seven years now—how does it feel to see conversations now in the national spotlight? Ervin: It’s further evidence for me that it’s important to be loud, vocal, angry, and unapologetic. It’s okay to speak up. With Stuff Mom Never Told You, we wanted to empower listeners by arming them with information so that they could go out and make a decision for themselves. We feel the same about Unladylike. For years now, what’s guided us is wanting to help women and gender nonconforming people of all backgrounds have the knowledge to make sense of what seems like a senseless world—while also having fun and laughing a lot. How do you deal with backlash and criticism in response to your work? Conger: Criticism is always going to be unpleasant. It’s human nature to focus on the negative things that come up, but the skill we’ve had to develop over time is to automatically filter backlash based on pure emotion and opinion versus backlash based on actual criticism and thought. Paying attention to substantive criticism and backlash is important, and it has helped us grow, expand, and improve how we present different topics. But we also stay vigilant in filtering out the noise. Ervin: We have this unspoken relationship with the audience we’ve built—a lot of times we will get criticism but it will be so loving, and that’s such a privilege. People have been listening to us for years, and they know that we have the best of intentions. There’s a certain trust there, so people feel comfortable coming forward and saying, “Hey, I know you didn’t mean to do this,” or, “Perhaps you didn’t know this, but here’s some information,” and we’re able to take that and be very grateful for it. Tell me about the forthcoming Unladylike book. Conger: Unladylike: A Field Guide to Smashing the Patriarchy and Claiming Your Space is coming out from Ten Speed Press in October and is essentially a social justice self-help book. It summarizes that overall goal to help women make sense of why their lives are the way they are. In a lot of ways, all of the media that we make is the media that we wish we had when we were younger and trying to figure out all of the social garbage imposed on women. Feminist books often will focus explicitly on your work life, love life, or on politics, but this is our acknowledgement that we can’t turn this stuff on and off. It’s always with us. Rather than being super overwhelmed by that, this is a guide through it, so hopefully you don’t have to go through as much of the sexist swamp as we did. What makes you hopeful about the future for women and girls? Ervin: Angry women! Angry women make me so excited and hopeful for the future. I love an angry woman who speaks up and doesn’t care what other people think, or if she does, she speaks up anyway. I hate that it all has to be in the context of our political moment right now, but I love that there’s a fire under so many women and a push to listen to them and believe them right now. Conger: As a Georgian, [2018 Georgia gubernatorial candidate] Stacey Abrams makes me hopeful in that she represents women, especially women of color, in politics on the state and local level who are entering [political] races. There’s so much momentum and excitement among women in Georgia, and Abrams is leading the charge on that. I’m actually excited for the Georgia gubernatorial race. We also have [Atlanta Mayor] Keisha Lance Bottoms. It’s an exciting time to be a woman in Atlanta.